Last night, I received a Facebook message from a Grade 8 student asking why non-terminating repeating decimals are rational. I am posting the answer here for reference. Rational numbers is closed under addition. That is, if we add two rational numbers, we are guaranteed that the sum is also a rational number. The proof of this is quite easy, so I leave it as an exercise for advanced high school students. Where is the Nobel Prize in Mathematics? 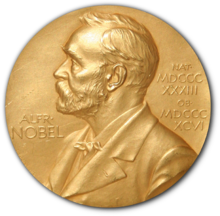 The Nobel Prize are prestigious awards given each year to individuals (as well as organizations) who have contributed significantly in cultural and scientific advances. Alfred B. Nobel, the inventor of dynamite, bequeathed 31 million Swedish kronor in 1895 (about 250 million dollars in 2008) to fund the awards for achievements in Chemistry, Physics, Physiology and Medicine, Literature, and Peace. In 1901, the first set of awards were given, and in 1969, the Nobel Foundation established the Nobel Prize for Economics.